The Arizona Printing Company, a local, Phoenix-based printing company needed a ground-up online experience. We began work on designing a logo, created a brand strategy and developed a complete online storefront. AZPrintingCo was created to bridge the gap between finding a low cost printing provider and a local company that can be responsive and offer fast turnaround times. We incorporated unique typography combinations and chose a color scheme that spoke to the local origins of the business and felt modern and attractive. Because of the company’s reliance on a variety of products the layout needed to be carefully designed to avoid clutter. As a result, we used a grid pattern that seamlessly uses white space and sublime backgrounds to create blocks with varying degrees of importance. We wanted to design an experience based on 2 factors: ease of use and readability. As a result, the website features summary product information and a quick checkout process. This simplifies the customer’s order placement and seeks to reduce friction from the purchasing activity. One of the key features of this project was related to how the organization could maintain and easily continue to promote products with minimal or no input from a developer. As a result, we integrated marketing management functionality into the website back-end. 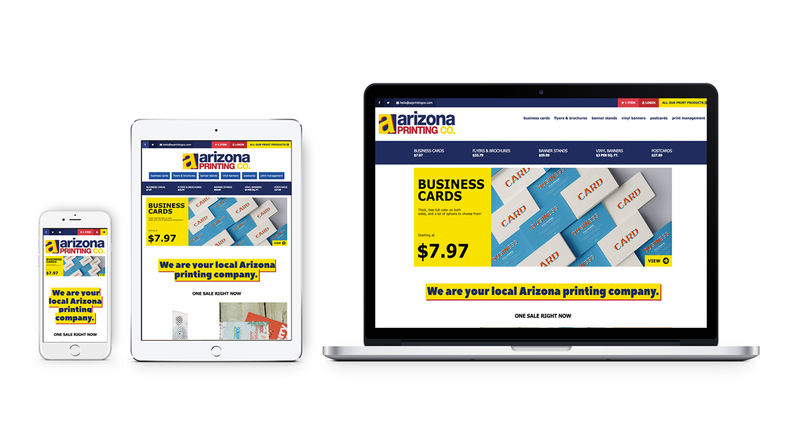 With minimal training, anyone at The Arizona Printing Company can easily work on promotions and new content without any prior knowledge of web design. The project gave us the chance to not only provide a powerful brand experience but rather help the organization simplify how it manages its online marketing strategy.